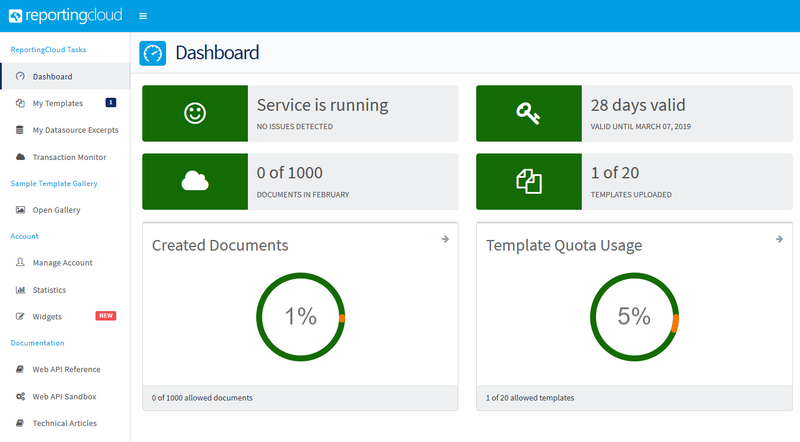 The free ReportingCloud trial account allows you to test-drive the full functionality of ReportingCloud. It can be used for 30 days and is limited to 20 templates in the template storage and up to 1000 document transactions per month. The trial account will fall back to the free version after 30 days that can be used to create up to 100 documents per month with several limitations. Sign up for your free trial account on https://portal.reporting.cloud/account/register/. Part of the signup process includes verifying your e-mail address which is mandatory before using the service. Once you finished the onboarding process, you are able to login to your ReportingCloud Portal. The portal gives you an overview of your recent activities, the service status and your usage quota. Additionally, the portal allows you to create and manage templates and data source excerpts. The trial account provides most functionality that is offered with paid accounts. However, there are some restrictions and limitations while in trial mode. The test mode enables you to test transactions that would usually count against your quota. By using the test mode, these requests are not counted against the quota, but are handled with lower priority and documents contain a watermark. The trial account can only create DOC, DOCX, RTF, HTML and PDF documents. All documents contain a watermark. Additionally, the ISO standard format for PDF archiving PDF/A is not supported using the trial account. If your test-drive was successful and you would like to go into production, you can simply convert your trial account into a paid account. All you need to do to upgrade is to buy a subscription in our Text Control Online Store. Click Buy Products and select the ReportingCloud tab. 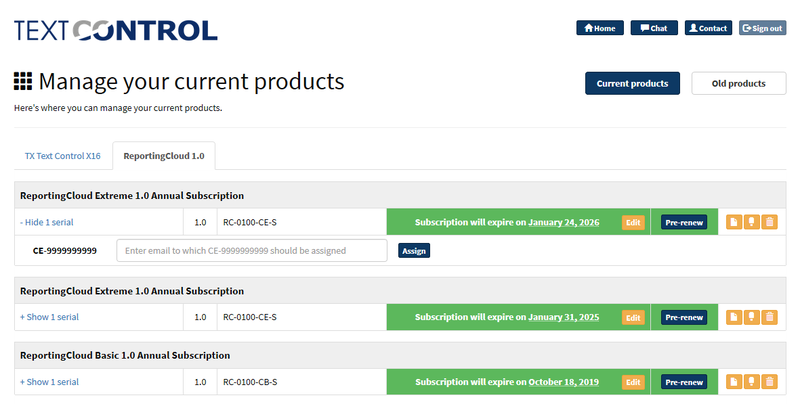 From the available subscriptions (annual and monthly), select the license you would like to acquire, add it to your cart and follow the instructions. After the payment process, you will find the licenses in your Manage Products section. The serial number is independent from your account and can be applied to any ReportingCloud account (one time). Note or copy the serial number to the clipboard. 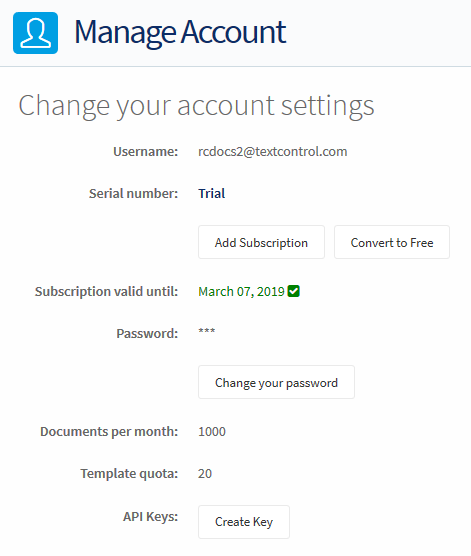 Back in the ReportingCloud portal, click on Manage Account to open your account settings. Click on Add Subscription to add the serial number from step 4. Confirm with Add Serial Number. 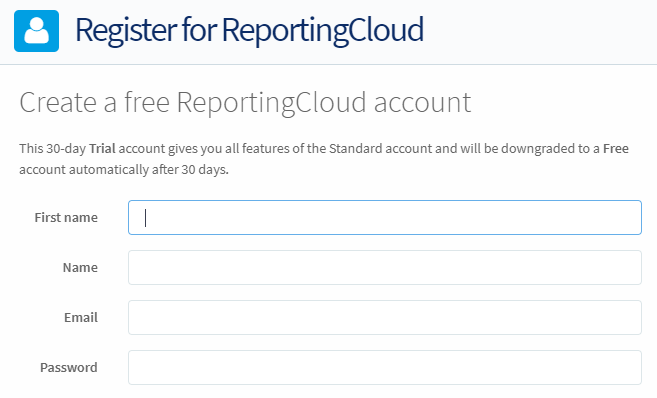 After adding the subscription to your ReportingCloud account, you should see your updated account settings.